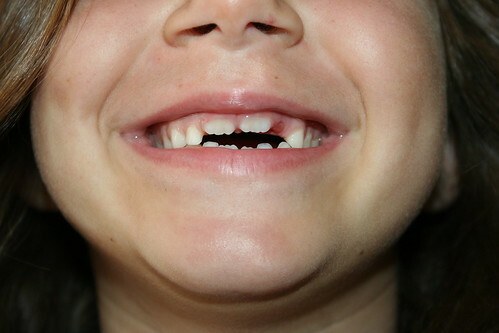 Guess who lost two teeth this week? New teeth and a new empty spot too, originally uploaded by Temeculamom. Yep, this is the one. She finally got her two front teeth, about 8 months late for Christmas. Then this week, she lost two more baby teeth. She left one for the Tooth Rat (with a poem she wrote) and one for the Tooth Fairy. Both left money, and the Tooth Rat left a poem as well. Just thought I’d share this quickly. We have started football practice, so that is taking up about 20 hours a week, and a friend’s gone for the week, and let us have access to her pool, so we have been offline most of the time. I hope to be commenting on some of your blogs again soon. Fingers crossed, I will be starting a new part time job next week, teaching ESL to college students from around the world. It would just be 6 hours per week on Tuesdays and Thursdays, so it would be ideal. Well, I’d best run. We are still without air conditioning here, and it is our 16th anniversary today. I do think the least thing I could do is to be sparkly clean when Nick gets home. 🙂 The house, not quite as much, although I have managed some big improvements today. ~ by bekaboo on August 15, 2008.
oh finges crossed you get the job, you will love doing that. I did that part time last year while I was studying and loved it. Happy anniversary, enjoy your special day. As for commenting on blogs, pfft, the world doesn’t end if you dont lol. I say enjoy the pool and football and fine weather. We are about two weeks away now from Spring and I can’t wait, because its closer to summer. So exciting, losing baby teeth! Ethan is still waiting for his 2 front teeth to come in, it’s been ages since they fell out and he’s had the gappy smile for some time now! All the best – I hope you get the job! Yay for the anniversary, fingers crossed for the job and S. looks adorable! Jaylene says: Wow, she looks the same as i did.